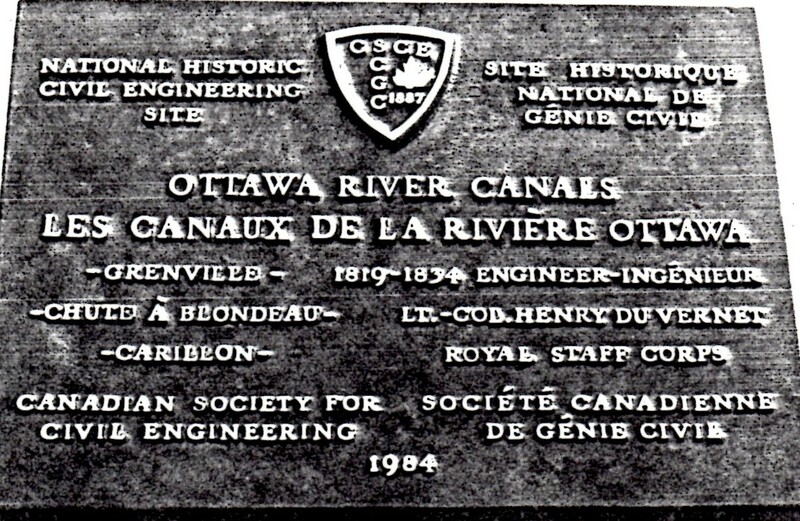 DESCRIPTION: The Ottawa River Canals were “Canada’s First Public Work” and were built on the Ottawa River to facilitate boat traffic between Montreal and the Rideau Waterway. They were constructed under the supervision of Lt-Col. Henry Du Vernet and were completed in 1834. HISTORICAL SIGNIFICANCE: In the early 19th century, Kingston was a key fortress of Upper Canada, being both a military and a naval base. The war of 1812 showed the vulnerability of its supply line from Montreal, up the rapidas of the St. Lawrence River and including the international section above the rapids. What was required were three small canals to circumvent the Long Sault of the Ottawa rRiver at Hawksbury. 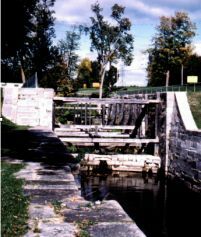 In 1819 work was commenced on the Grenville Canal under the command of Lt. Col. Henry du Vernet. In 1826 work was started on the Chute-a-Blondeau and Carillon Canals and all were in use by 1834.